Top: Ms. Shirel Friedman, injured by Kassam rocket, later died at hospital. Bottom: Shirel's funeral held at Sderot cemetery. SDEROT-- A Qassam rocket hit a car at a shopping mall in Sderot on Monday evening, May 21, killing a woman and moderately injuring two other people. Magen David Adom teams responded immediately, treating the victims on the scene before rushing them to Barzilai Hospital in Ashkelon, however doctors were unable to save Shirel Friedman, 32. She was the first fatality in the unrelenting barrage of more than 160 rockets that have been fired by Hamas from Gaza at Sderot and the western Negev since May 15. Friedman was buried at midday on Tuesday, May 22 in Sderot, the first Israeli to die from a rocket attack since November 2006. Earlier today, terrorists in Gaza resumed their rocket attacks on the western Negev , firing three Qassam rockets that landed in open areas. The MDA Emergency Medical Station in Sderot normally has a compliment of two MICU (Mobile Intensive Cardiac Care) ambulances and three standard ambulances, with 14 employees, 22 volunteers and two youth volunteers. As soon as the Qassam attacks escalated last week, Magen David Adom's Director General Eli Bin ordered additional equipment and personnel to reinforce MDA's presence in the western Negev . Sderot now has 15 MICU ambulances, four Multi Casualty Response Vehicles, three service vehicles and 100 standard ambulances -- all fully equipped and staffed. An outdoor air conditioned tent has been erected outside the small MDA Station in Sderot, along with portable showers and toilets to accommodate the extra personnel brought in from around the country. MDA is also taking steps to reinforce the MDA Stations in Ashkelon , north of the Gaza Strip, and Tzohar, south of Sderot, which have also been targeted by terrorist rockets. American Friends of Magen David Adom is building a new, reinforced 2,500 sq. foot state-of-the-art MDA Emergency Medical Station in Sderot. This new facility, which will house standard and MICU (Mobile Intensive Cardiac Care Unit) ambulances as well as a staff of 16 and 70 volunteers, will serve the 25,000 people of Sderot and residents of the entire northern Negev region. Included in the new facility will be ambulance bays, an emergency shelter, EMT and paramedics rooms, as well as medical supplies storage and sophisticated communications and security systems.replace the existing structure which has been declared a hazard by the municipality. Sderot is located only one kilometer from the Gaza Strip. In the last six years more than 4,000 Qassam rockets have been launched from Gaza . Despite a ceasefire agreed to by Hamas on November 27, 2006, nearly 400 Qassamim as well as mortar rounds have been fired towards Sderot from that time to May 1, 2007. 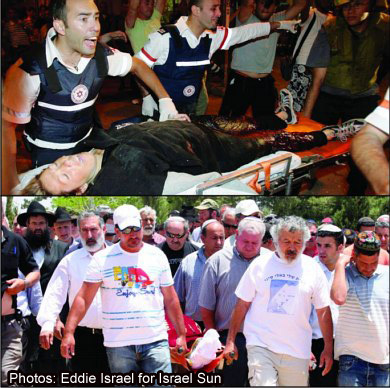 American Friends of Magen David Adom – ARMDI is the authorized organization supporting the life saving efforts of MDA in Israel and representing Magen David Adom in the US . Magen David Adom (MDA) is Israel ’s only government-mandated ambulance and emergency medical responders, serving as the nation’s second line of defense with medical, disaster, ambulance and blood services. Thanks to AFMDA/ARMDI supporters, more than 700 MDA ambulances and Mobile Intensive Care Units are on call 24/7, operating from over 100 Emergency Medical Stations and 11 dispatch stations throughout Israel, logging more than 6 million miles and taking care of 600,000 patients annually. MDA also provides 97% of Israel ’s blood needs and has launched the MDA Israel Cord Blood Bank. During the 2006 Lebanon war, MDA was on full alert, responding to more than 1,500 lifesaving incidents, treating 2,600 people, collecting and supplying 32,000 blood units for civilian and military casualties and providing food, water, toys and comfort for Israelis in bomb shelters.